Even when it’s at its best, Modern Family is not a show that’s strong on plot. We’ve seen every conceivable character combination and plenty of ratings-grabbing big events, but when it comes down to it, it doesn’t matter whether Gloria has a baby or if Haley goes to college. 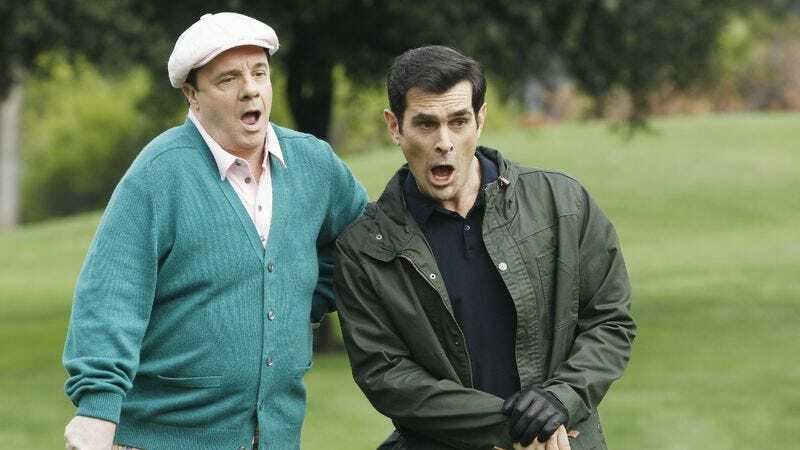 What's most important is that Modern Family can still pull out strong episodes, so long as the writing is solid and the show can avoid falling into its own clichés. Tonight’s story on its own doesn’t sound too promising. The girls especially get clunkers of plots. Gloria and Alex visit a psychic, Haley and Dylan babysit li’l Joe, and Claire, in the most asinine plot to greet her in a while, is obsessed with recreating a potential accident that Phil could have caused. Meanwhile, Phil, Jay, Mitch, and Pepper, golf while Cam is trying to pull off a school production of Phantom Of The Opera. Manny yearns to play the lead, but he’s replaced by Luke, who is supposed to paint sets but unexpectedly possesses a beautiful singing voice. However, one good thing is that the writers relaxed on two typical Modern Family tropes: Mitch and Cam were never onscreen at the same time, hence we were spared their adorable neverending bitching at one another, while Jay, softened by new-fatherhood, isn’t nearly as tough as usual on Phil, who thus isn’t as pathetically desperate for his father-in-law’s approval. In a fun switch, though, Phil realizes that he golfs better when he’s being berated, and so he asks Jay to give him the business. Of course, the guest stars didn’t hurt the episode either. The writers of the show clearly have fun working with Nathan Lane as Pepper, whom we learn this time around has a son who is a deeply embedded Navy S.E.A.L. (“Stay strong like Kyle did in Yemen,” he instructs himself as he tries not to cry with all the other dads as they listen to “Cats In The Cradle.”) And Fred Willard’s career seems to be doing OK as he came back as Phil’s dad, a man so supportive he drives up from Florida to see his grandson’s set paintings in a school play. “Nice form, son,” Frank Dunphy praises a trampolining Phil who helps a client sign a real estate contract. Ultimately, the writing made the episode. Were Haley, Alex or Claire really relevant? Not really, but the show can still pull off a pretty funny installment without giving everyone a great storyline, so long as the jokes are silly, strange and rapid-fire. Who did the “Cats In The Cradle” gag better, Modern Family or SNL? Pepper’s father’s last name is Saltzman, so his name is… Pepper Saltzman? I like how it’s kind of accepted that Luke is a huffer. He’s basically a baby Charlie Kelly from Always Sunny. If somebody had asked me when I was a month postpartum to go running around town getting stuff together for a school musical, I would have laugh-cried until my face melted off like it was the climax of Raiders of the Lost Ark.